Matthew F Fisher creates stylized paintings of landscape and nature imagery. Fisher plays with personal vs. universal conceptions of imagery, depicting common scenes and images – sunsets, waves, ocean horizons – to highlight how the image perceived is not necessarily what is actually depicted. Blending abstraction with figuration and imbuing his works with a graphic painterly quality, Fisher’s landscapes blur the line between real and unreal. Layering acrylic paint with concise brushstrokes and vibrant, striking colors, Fisher’s paintings create vivid impressions of scenes and imagery that we often take for granted. Born in Boston, MA and based in Brooklyn, NY, Fisher received his BFA from Columbus College of Art and Design, subsequently earning his MFA from Virginia Commonwealth University. I was first introduced to Fisher’s work at Spring Break Art Fair 2016, NY in the show Ten Years, curated by Jon Lutz. His work has been shown in numerous solo and group exhibitions including Sun, Stars, Sea, and Moon at Airlock Gallery in San Marco, CA and In Which We Dwell at the University of Arkansas this past year. Fisher’s solo show Oberservable Universe opens this month, January 18th 2017, at Taymour Grahne Gallery, NY. How did you first become interested in art and start making work? I think the short answer is that my parents were both scientists, and maybe that allowed them to realize that I wasn’t good at anything else. I don’t mean that in a negative way, but I couldn’t really spell, math wasn’t my thing, but I really enjoyed art. I grew up in the Midwest and my parents are from the New York City area, so they were very encouraging for me to go see art and take art classes. When it came time to apply for college, my mom was just like ‘You’re only applying to art colleges, you can’t go to a regular college’, so I definitely owe a lot to her for that. And that was kind of what it was like. I was the guy that drew. I made art. I did a fast track - I did my undergrad in four years and then I went right to grad school, so by the age of twenty-four I received my MFA and I moved to New York City. That’s kind of when I started to figure stuff out for myself. From that point on, I just wanted to figure out what I wanted to say. I quickly realized that I wanted to make work that was completely different from what I was making in graduate school, so I kind of saw my years of school as a way for me to make all the work that I never wanted to make again. When I came to New York City I set out to find that new voice. Your work deals primarily with nature and landscapes. What initially attracted you to this imagery? One of the things that I wanted to get away from was constantly pulling from reference material. I wanted to get away from having that be the starting point, and I wanted to almost achieve that romantic notion of the artist who can go to a blank canvas and just open themselves up and create something. Before this body of work, I was trying abstract paintings, figures, styles, and stylizations. I remember one day I walked into the studio and just had this thought where I wanted to make a painting of nothing. That was my mantra when I walked in. When I sat down, I drew a horizon line and I drew a sun, the beach, and some grass. All of a sudden, I realized that this is everything that I want my nothing to be. That’s where this whole work kind of spun off. The earlier works I did feature these sculptural moments of blades of grass bending. Putting together several of those works, I realized that I started to have all these horizon lines, so in a way to break away from that I brought the water up into the sky, and that’s where the waves came out. When I showed them to my wife, she immediately brought up Hokusai and Japanese woodcuts. I was like, ‘Of course!’ When I looked at that work, I found this interesting idea that I think the work I make now plays with. 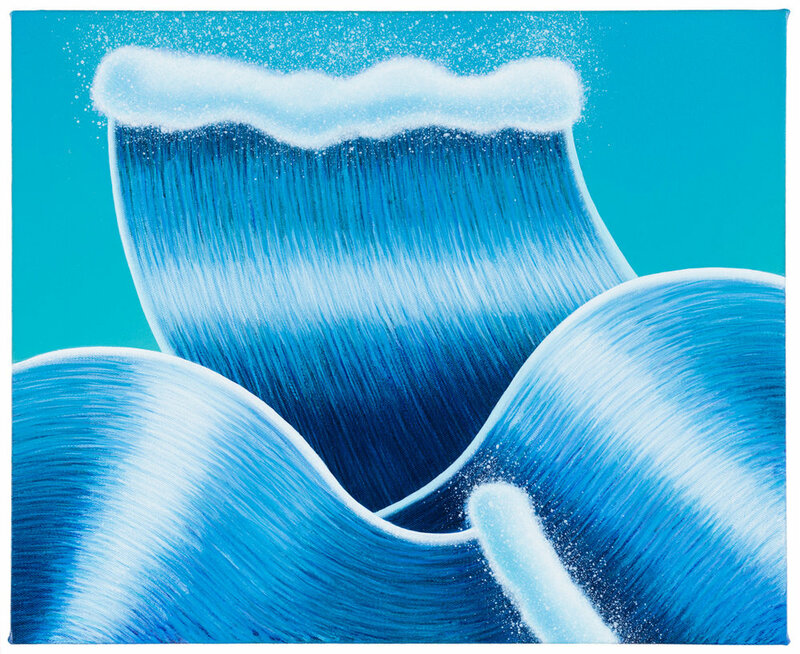 When we think of a wave, we conjure up this generic image of what a wave looks like, and that image looks kind of what my paintings look like. When we think of Hokusai’s work, we think they look like my paintings, but when you do a side-by-side comparison, they’re radically different. His work is so much more detailed and “realistic” than mine. So there is this idea of things in our mind being real, but in reality they are very different. There is a gap between what we know is real and what we think is real. Thinking of this personal vs. universal perception of image, where are you sourcing your images from - is it a personal conception and are you thinking about memories that you have, or are you playing more with universal conceptions of these images? It’s both in a way. My grandfather in the 1940s purchased land in the West Hamptons, so when I was a kid my family would go out every summer and spend weeks at this beach house. First of all, it had this name ‘beach house’, which was exciting, and back then the style of architecture was elevated houses, so it felt like you were living in a tree fort. It was just magically exciting for me to be there, and then it was right on the ocean so you could immediately see the ocean. At that time, I was trying to understand what the ocean was and how England and Africa could be on the other side of the horizon line, how there are animals underneath the water, and I was going to bed and waking up to it each day. So that was the start of my fascination with the ocean and with ocean imagery as a young kid. Later in life, my parents moved and now live on the west side of Lake Michigan on the water. Every year, a couple times a year, I go back and I visit them, so I experience the Great Lakes. There are some paintings of mine that are definitely tied to the ocean, that have the more violent waves. The ones that are more placid and calm I think are very much about Lake Michigan, which has this ability to be both tall and small. The ocean to me can never be that calm, but Lake Michigan can. Lake Michigan can almost not be there, it’s has tiny one-inch waves. So I think that’s kind of where it comes from. You’re work also plays with abstraction and figuration. Can you talk about this? When I was doing the previous body of work – and I’ve thought long and hard about this – I didn’t want to have a surrealistic style. I often talked about that earlier work in terms of magical realism, but I didn’t want to have a surrealistic style, so I adhered to the laws of nature and gravity and I kind of kept things as they would be in our lives. When I switched to this new body of work, I was able to free myself from those laws. I could have a crab in the air – almost like a Georgia O’Keefe painting, and very much an ode to Georgia O’Keefe in that sense. I love that O’Keefe has this object that is part of the nature behind it, part of the landscape behind it, but still independent and free. It takes on this whole new connotation. So that was one of the areas where I was able to do that, and with that I was able to push people’s expectations of what nature might look like. I could go more graphic, which I’ve always been interested in. It’s fun because having that horizon line and beach at the bottom gave me the freedom to go crazier on top. I could have this bizarre shape and people could then read into it. The sides of the canvas exist solely to frame what’s inside, so the placement is almost decided by the canvas itself. It’s fun playing with painting space. There’s also a level of geometry to it. When I think of a rock or an island in the side of the ocean, I don’t have a specific rock that I can come up with. I can create this imagery in my head, and I think that’s what this work is. Everything about it says rock, and we say it is a rock. But when you actually get into it and you analyze the structure that I’ve established, you realize that it’s the most un-rock that you’ve ever seen. And it’s kind of fun because it brings it back to what is real. I did earlier versions where I tried to make the water curve more traditionally around the rock, but then I was like, ‘No wait, I don’t actually want it to do that.’ I wanted the rock to be like almost paper-thin, just coming straight out of the water, so I enjoyed playing with that visually. It’s these little things. Your mind tells you that this is how ripples look, but when you actually look at it you’re like ‘Oh no!’ You’re putting it together, so it’s almost like you’re viewing the piece through this tube. And then you can stand back and be like this is the most ridiculous thing I’ve ever seen, but at first you just accept that it’s real. I kind of like that. Humor plays into it for me too. I don’t want them to be ‘ha ha’ funny, but I like the idea of them being funny with time. As you look at it, you slowly realize how ridiculous the whole thing is, and it kind of opens up to you like that. When you have these recurring motifs – the wave, the rock, the albatross – how do you approach each new iteration? In my mind I can visualize the end and what I think it’s going to look like, but I realize I always have to do the math. I’m thinking about how in school you can always go to the back of the book and see the answers – like the answer for problem number twelve is 50 – but you still have to do all the math to show the teacher that you did all the work and understand the problem. So, this is like that. I know what the answer looks like, but I know I have to go through it and see how it actually reacts. I allow it to grow, and that’s something I’m interested in. For these past few years, if there’s a voice in my head that says ‘You should do this,’ I’ve told myself that I have to honor that and go with the idea. I allow myself to have the freedom to change and be more intuitive with my decision making. And I really appreciate that. Do you usually start works by sketching or drawing? They vary. There are some finished drawings here that are framed that are getting ready to be shipped out. I like them being like that. At times they can be studies or they can be their own finished thing, or they can be variations of a painting or vice versa. I do a lot of sketching of ideas just to figure out placement. I try not to have every painting have a study for it. Even though the drawings are very separate pieces, it’s a way for me to remind myself of these ideas. I like the idea of being in control; the idea that I can come to these and create something on the fly, but through the process of making I allow the work to change. I think there’s this slow reveal that happens with the work, where once you get into it and start peeling it apart you realize that it’s almost illogical. But we accept the structure because we think it’s real. It looks real. Even for me, I go back and I analyze them. When did you start playing with color within these works? Back to when I made that shift from when I was making the more “traditional” landscapes and configurations. If you wanted a crazy colored sky, it had to be a sunset or a sunrise. But now I’m free to kind of have these palettes that are off-key, unworldly, outer-worldly, and it doesn’t necessarily have to be at those times. The dark stuff doesn’t have to be nighttime. So the freedom in my shift in thinking and creating work – the color is an extension of that. Do you see your work moving towards a particular direction? I think about it. Perhaps somewhere in the back of my mind I wonder how long can I continue to wring out this landscape motif. But as long as you still get water out of that rag, you just keep going with it. I feel confident already having made one dramatic shift in my work that when I’m ready to break up with this body of work, I’m just going to have to respect that voice and follow it. I don’t know where it’s going to go, and with every painting I make I understand more of what I’m interested in. When I make that next shift, whenever it might be, I feel confident that I can setup these parameters of what I want to accomplish. It’s sort of a fun place to be – to be extremely confident in what you’re doing, but not know what the next step is – because then you can just delve into it. I’ve always felt that if I don’t know something, that’s not a bad thing. Rather, that allows me to think more about it and come up with my own decisions, so I think I’m more comfortable in that element. I can make something and I can think it’s funny or ridiculous, or just far out uncool, but that little voice says do this do that, and I have to do it and it gives it the energy that I couldn’t put into it outside of that way of thinking. What do you think the most challenging part is when you’re making a piece? It varies. Sometimes the hardest thing about a painting is coming up with the title. I have a finite amount of time that I can be in the studio, so you can’t have a stinker of a painting. But every now and then it happens. I have this pile of paintings that just aren’t happening – they’re tucked away in the corner and they’re not behaving well. At some point you either have to finish the painting and try to figure out a way so that you’re interested in it, or you just have to put it aside. That’s the hardest part. If a painting isn’t working then how much time do you put into it? Can you make it work? What will make it work? Sometimes the answer to that is just walking away and coming back to it six months later and realizing that it was kind of a cool idea that you want to go back into. When I’m in the studio, it’s almost like a factory process. I know how I want to make the image and it’s the making the image that sometimes tells me what to do next. I’m just in here going through these layers to make the image, and then I’ll tell myself to change my mind or put something new in it when I get that thought in my mind. I guess the short answer is the hardest part is the actual making, and then ironically that’s also the funnest part. So it’s a circle, it answers both questions from different angles. My personal taste of other people’s art I’m realizing can generally be described as children’s art and abstract art. And I say children’s art not to be derogatory, but I’m thinking of the crude, crunchy styles of other people’s paintings. I like the energy in that, and then I also like the very hard, graphic quality. I’ve looked a lot recently at color field paintings from the ‘60s from the American color field school. Of course everyone knows some of the first names – Frankenthaler, Kenneth Noland, Morris Louis – I love those. But then the second school where these cats like Thomas Downing, Sam William, Melman – I love looking at their work because it’s fresh. And I find energy in a lot of folk artists; you know, people who didn’t have these rules that they put for themselves and instead they just made stuff. I just love that freedom. I don’t copy what other people do, but I try to tap into that energy. When I’m really in a rut, the easiest way for me to get out of that is to see what I’m doing and to do everything differently. If I’m making a lot of verticals, alright now I’m going to make horizontals. If things are blue, this is going to be pink. If it’s during the day, it’s going to be at night. It’s kind of fun because you know that if something is working, then illogically in making a painting, if you do everything differently it should also work. So I kind of go that route and allow that to be the answer. It’s fun because, having made a lot of this work, this imagery in a way is part of my lexicon and vocabulary. I’m not looking to somebody else to get the next idea, but rather I’m pulling from what I’ve already done. And then the universe doubles back again and now you’re able to pull from this new thing. It’s just an interesting back and forth. How would you describe your aesthetic and work at this point, in the context of looking at your own history of what you’ve made until now? The answer is that as you get older, you become wiser and images that seem flippant or spontaneous take on a whole new meaning. I guess the elevator speech is that I make stylized landscapes of the ocean, and I think that’s where they’re at. They’re just these moments, and they’re almost iconic. The biggest vista that I have is a painting of nothing – just the water lapping at the shore. So I think they kind of have this iconic feeling, like a feeling of elevation. I’ve started playing with paintings that manipulate the stretcher bars of the canvas. I like the idea that what’s inside can affect the outside of the composition. When you see a painting of mine that has that slanted-ness to it, it is tied to the elements that are inside. On a different level, our eye tells us that since everything is square, then the painting is square. Some people are here and it takes them 45 minute or an hour before they notice that the painting is not square at ninety degrees, and I’ve kind of enjoyed that. Have you always worked with acrylic paint? I have, and that’s because when I was in graduate school I ended up making these hard edge, minimalist paintings that acrylic was best for. When I came to New York City I had a bucket full of acrylic paint, so when it came time to start painting, even though I was trained as an oil painter, I didn’t want to go out and buy oil paint. I was painting in my apartment, turpentine – all that stuff stinks – so I set out painting with this acrylic paint. I kind of taught myself how to paint the way that I paint with it. Ironically, I don’t think these works could exist not being in acrylic because it’s really about the layers. I almost paint like a watercolorist would paint because these works have so many layers. I have a few days where I’m here during the week and on weekends. Because I paint in these layers, instead of having a solid eight hours, if I can do four, two-hour days I can get a lot done in that time because you need time for the layers to dry in between. I’m fortunate to have a drawing studio at home so I’m able to do a lot of drawings at the house when I can’t get here and can keep the ideas flowing, and I appreciate that. The drawings are radically different from the paintings, and I don’t want the drawings to look like the paintings. I want the drawings to have their own language of being made. I’m not making a graphite version of the painting on paper; instead they exist on their own. The drawings do what the paintings can’t do. The drawings are ink wash, so they have eight or ten layers of ink wash just to give them that density. I’m always trying to give them a sense of density. When you see them in here, jammed up against the window in my studio, they don’t seem that dense. But when you take them out into a gallery and see them, they always strike me as being these little black holes, very heavy and thick, which I think make them uniquely East Coast, New York. We don’t have a lot of room here, so they kind of become your whole life. Can you talk about the scale of your works? For a long time 16” x 20” was my largest canvas, and that’s how big I’d want to get. I was fortunate enough to go back to Yaddo for a residency in 2015, and because I had four weeks to be in the studio there, I scaled up. This was a unique opportunity, so I brought larger canvas bars and since that point I’ve consciously decided to go a little bigger – so 20” x 25” or 20” x 22” instead of 16” x 20”. They’re not that much bigger, but I think of them as bigger. The only real limitation I have right now is that everything gets varnished at the end, and when it gets too big you have to rent a sprayer and do a whole other level of work. It get’s boring, but the water sags the canvas so the varnish can pool in the middle of the work and you have to worry about that. The limit is about 30 or 40ish inches where I can varnish with a brush and not have to worry. Beyond that, I just don’t know if these images would be interesting bigger. I’ve thought a lot about it, and I think there are certain images that I’d love to see larger. I just don’t want to make big for big’s sake. Andy Warhol always said that if you’re always late and you show up on time, people will think that you’re early. So, if you always make paintings that are a certain size and then you scale up – it’s not that much bigger, but people will think it’s huge. The bigger ones also have bigger stretcher bars, so there’s more of a presence, more of a monumental quality to them because they come of the wall. Then, like with the rock painting, scale comes into play. You don’t really know – is it a big rock, is it a little rock, is it an island? It’s kind of fun because with waves – we all kind of know how big a wave is, but rocks it could be a pebble or it could be a boulder. What advice do you have for artists just beginning their own studio practice and developing their own body of work? I think the short answer is you have to make work, and you just have to keep making work. For me, I felt like the work finally became something around 2014, which is 14 years after I graduated from grad school. The work from 2014 on began to take on a whole new energy and excitement for myself, and I was only able to get there through making more work. The other advice I have is to make as many acquaintances as you can. Make many friends and very few enemies. You never know who is going to be there and why. It’s nice to be nice.